One year ago, Oklahoma’s Baker Mayfield couldn’t possibly be the No. 1 pick in the NFL draft. It had to be USC’s Sam Darnold. Or maybe it was Wyoming’s Josh Allen. Until, well, maybe it could be Mayfield. Welcome to April in the NFL draft, the Kafkaesque month of misinformation and propaganda that would put a communist-run newspaper to shame. A time when professional football becomes a snake of lies that wakes up every morning and eats its own tail. This is why mock drafts and months of debate go out the window in a matter of minutes in late April: most of the arguments are based on fairy tales. If we didn’t learn that last year, maybe we’ll never learn it. Coming out of last year’s Senior Bowl, the mere suggestion of Mayfield being in play for the No. 1 overall pick was ridiculed. That actually happened. I wrote Mayfield was a legitimate Browns target after the Senior Bowl in Mobile, Alabama. By the time I got to the airport, a league source had called me to say that I should be embarrassed by the column, at which point I made sure to tweet out that not everyone agreed with my assessment. So, yeah. The NFL draft. Good times. Here’s the postscript to that whole thing, and it speaks to how ridiculously flooded the league is with lies: Not only was Mayfield the Browns’ No. 1 quarterback on their board, the guy who many assumed was actually No. 1 (Darnold) wasn’t even in Cleveland’s top three. That’s right, the same Darnold who was pegged as the No. 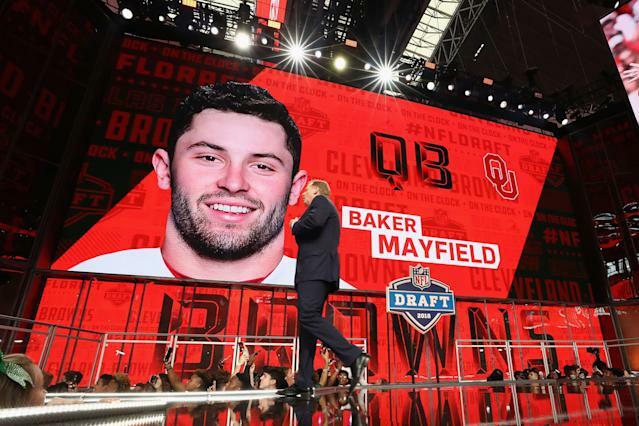 1 pick for months – before a late potential audible to Allen – was actually placed behind Mayfield, Allen and UCLA’s Josh Rosen. That’s how skewed draft information is. The analysts and insiders got it wrong three times before the Browns eventually leaked the truth minutes before the draft. Couldn’t be Mayfield. Had to be Rosen. Maybe it was Allen. No, it was Mayfield. For months, actually. It’s worth keeping that in mind now, seeing that we again find ourselves in a situation where Kyler Murray seems to be the pick for the Arizona Cardinals. This despite Rosen still showing up for offseason work this week. And despite teams suggesting privately that Arizona hasn’t put Rosen on the trade block. That’s all a ruse, right? Just angling to get a better deal. Right? Maybe. Or maybe it’s a bunch of lies and we’re falling right into it. Again. With that in mind, here are a few highly graded players in this draft who have some conflicting information or opinions (or a void of important information) floating around about them late in the process. Call it what you want – lies, spin, misdirection, concealment. It all might fall under those definitions by the time draft night gets here. From the start, there has seemingly been a lot of lying going on about Murray. First, the lies about his height being slated to come in at slightly shorter than 5-foot-10, which were weirdly given credence by the Oklahoma football program at one point. Then the (alleged) lies about Murray having terrible interviews and being bad diagramming plays on the whiteboard with teams. And now, the swirl of conflicting information about whether Arizona has settled on him with the No. 1 overall pick. A source close to the evaluation who spoke to Yahoo Sports has said – and reiterated – multiple times since February that Murray is the target at No. 1. This despite Rosen being in the facility during the workout program and a building awkwardness around the entire quarterback situation in Arizona. One way or another, some lying is happening about Murray and the Cardinals right now. Either by the Cardinals or by other NFL teams who are engaging in a long, drawn-out trade dance. As of late last week, a handful of league sources believed that the Los Angeles Chargers have become the No. 1 team in the Rosen sweepstakes. But a source inside the Chargers said if that’s the case, the plans are being kept between as few as two or three people at the top of the organization. The same source did allow that the Chargers are looking over their quarterback options, so it would make sense that Rosen is on the table. Here’s what we know about Murray: Cardinals coach Kliff Kingsbury is on board with him as a quarterback prospect. General manager Steve Keim and team owner Michael Bidwill appear less certain, particularly as it relates to whether Arizona can get something valuable for Rosen. The Cardinals are playing out a game with other teams, Rosen, Murray’s camp and the media. Rosen is playing out a game with the Cardinals. And teams that are seated directly behind the Cardinals in the draft – including the San Francisco 49ers, New York Jets and Oakland Raiders – are all trying to figure out what is happening in between. For roughly two months before the scouting combine in February, Haskins was touted to be either the No. 1 or 2 quarterback in this draft. Then the sifting process started and some vaguely negative evaluations started to come out. Four sources from different teams told Yahoo Sports coming out of the combine that Haskins was no better than the third quarterback on their board, with either Missouri’s Drew Lock or Duke’s Daniel Jones being rated ahead of him. Proclamations that seemed a lot like the typical lying you’d hear in March about quarterbacks since teams try to conceal who they like in hopes that a coveted player like Haskins slides. What has been different about Haskins is the malaise about his evaluations has lingered for a while now, with teams nitpicking as the months have moved along. To the point where some team sources with critical Haskins assessments have pointed at a few prominent draft analysts as being the individuals who planted the notion that Haskins was the top quarterback in this draft. In other words, the hype about Haskins being a top-10 pick has been media driven, not team driven. That is what a team would say if it was hoping to get Haskins outside of the top 10. 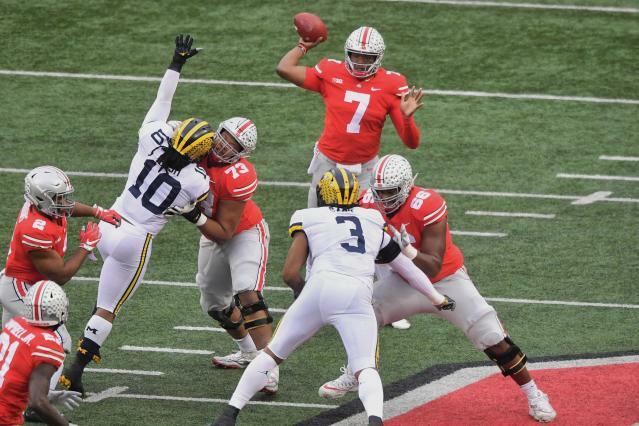 The most intriguing assessment I heard about Haskins from a league source was this: In many ways, his evaluation and some of the knocks on his game were similar to the ones that teams pinned on Rosen in 2018. The difference? Rosen had a better pure passing stroke, but also more tape to pick at during assessments. He also had some perceived red flags about his leadership style that were more negative than anything in Haskins’ dossier. The source boiled it down as Haskins being similar to Rosen with less of a pure passing stroke, less tape to evaluate, which means a higher chance of getting the pick wrong. And all of that signals caution, causing a player to slide down the board. Add in the fact that the Cardinals don’t seem to have teams beating down their door to get Rosen one year after he was selected No. 10 overall, and there’s arguably more ammunition to suggest Haskins won’t be the top-10 pick everyone assumed. This means either his stock was bloated by analysts who don’t work for teams, or some NFL teams are lying about reasons not to like him. Take your pick. It’s fair to say a negative evaluation like that can’t simply be pegged as a lie. But there are definitely some scouts, executives and coaches who don’t all extend Bosa the “can’t miss” assessment that has gotten lavished on him in many corners. Maybe something more along the lines of “less likely to miss but less likely to be an All-Pro” is the tag some would reach for. Whether that’s right, there are people who aren’t buying some of the resounding Bosa applause, either. So, Greedy is supposedly falling. Unless he isn’t. Williams has gotten his share of fastballs in team interviews, with questions about whether he’s soft and doesn’t like contact to his ego and attitude to anything in between. One of my favorite texts about Williams came from a source intimately familiar with Derrius Guice. The source said simply, “Williams has some Derrius Guice in him.” In last year’s process, Guice was known to have a big ego and think a lot of himself, so there’s that whole parallel to debate. Williams’ bigger concern is his tackling, which some teams apparently termed to be so bad at times, it was like LSU was playing with only 10 men against the run. That’s about as negative as you can get when it comes to knocking someone’s willingness to tackle. Sweat has a lot of information going in different directions. Some evaluators love his length and first step as a pass rusher, with one evaluator even ranking him ahead of Bosa in that respect. Others say he’s a “run around you” player who won’t deal well with physical offensive tackles in the NFL and hasn’t shown he can develop a multitude of pass-rush moves to defeat different scenarios. He also had some prickly reviews coming out of the combine in two respects: some felt he required too much instruction in the drills, as if he weren’t paying attention, and others in interviews felt he was a little withdrawn in the process. Garden variety stuff when you’re parsing out players or floating negative evaluations to throw off interest. More interesting is the information about the minor heart condition that leaked coming out of the combine. This is where a lot of the lying comes in. Some are suggesting there is no such thing as a “minor” heart condition and Sweat is in for a fall. Others say it’s simply a matter of a medical re-check to determine if a team is comfortable with him moving forward. In some respects, this has echoes of Maurice Hurst last season. Hurst was ultimately cleared in a re-check and supposedly wasn’t going to fall much further than the second or third round. He ultimately plummeted into the fifth. This is part of what comes with the murkiness of medical assessments. We’re never sure how serious teams take them, partially because of privacy issues and partially because there is currency in either concealing or inflating information. When Reggie Ragland was diagnosed with an enlarged aorta before the 2016 NFL draft, the assessments were that he’d still be taken in the first two rounds. He ultimately went 41st overall. Sweat questions are producing some of those same “his stock won’t be affected” vs. “it’s hard to say where he’ll go” conversations. You can be sure that teams have an accurate read on it as they did with both Ragland and Hurst. But they aren’t saying due to some mixture of privacy concerns or being able to use the information to their advantage.